In this tutorial, you will learn how to turn the scene you built in the Build your First AR/MR App tutorial into a stereo pass-through AR experience. *Stereolabs’ ZED Mini mounting bracket was designed for the Oculus Rift and original HTC Vive. It can fit on some WMR headsets like the Samsung Odyssey, but you will need to create a custom attachment for the Vive Pro or other WMR headsets. To set up the ZED Mini on your headset, follow our guides for Oculus Rift and HTC Vive. Use the provided straps to attach the cable to the headset, and make sure to plug the USB Type-C cable into your ZED Mini with the arrows facing forward. In Unity, Go to Edit -> Project Settings -> Player. On the right under XR Settings, check the box for Virtual Reality Supported. Doing this will add a list of VR SDKs your project supports, which by default includes Oculus and OpenVR (SteamVR). If you’re using Oculus Rift, enable Unknown Sources in the Settings of Oculus Home. This will allow your brand new AR app to play inside the Rift. Follow the steps described in the Build Your First AR/MR App tutorial. In your Hierarchy, delete the ZED_Rig_Mono prefab you added in the last tutorial. In the Project window, go to the ZED -> Prefabs folder. Click and drag the ZED_Rig_Stereo prefab into the Hierarchy window. Run the scene and put on your headset. Take a look at the sphere and the shadow beneath it. Walk around it, put your hand over and under it. 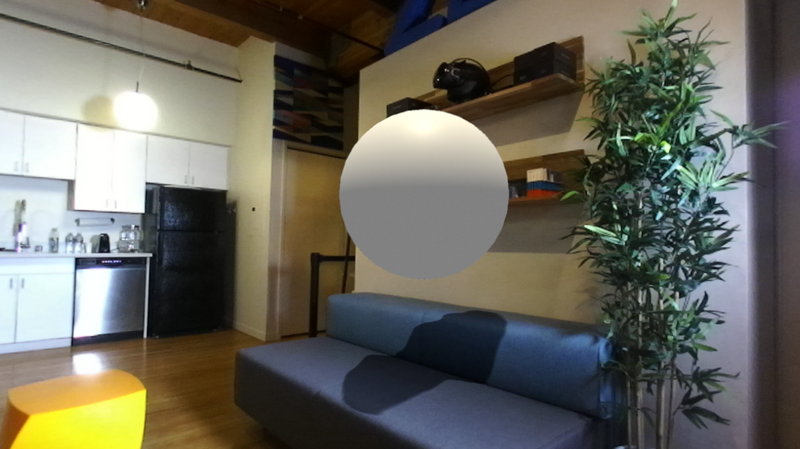 You can also move the sphere in the Scene window and watch it fly across your room. You’ve built your first ZED Mini AR app! To see a similar scene already put together, check out the Planetarium example scene in ZED -> Examples -> Planetarium -> Scene. If you want to disable inside-out positional tracking to use Oculus or Vive external tracking systems, go to ZED Manager and uncheck Enable Positional Tracking. This will disable our Video Async Timewarp effect for latency compensation but can improve tracking accuracy in some situations.